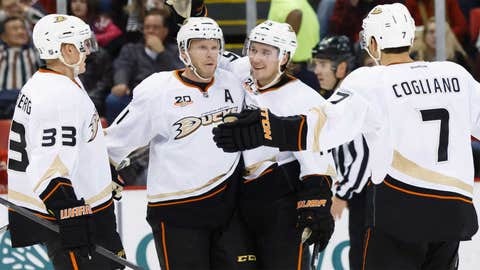 DETROIT (AP) — The Anaheim Ducks used a fast start to stay on a roll. NOTES: Anaheim D Mark Fistric missed his third game with an upper-body injury. … Jurco was recalled from AHL Grand Rapids on Sunday … Anaheim captain and center Ryan Getzlaf went to the dressing room with 5:40 left in the first period after being shoved into the boards from behind by Detroit defenseman Kyle Quincey. Getzlaf’s mouth was cut and Quincey got a five-minute boarding penalty and a game misconduct. Quincey faces a possible suspension. Getzlaf returned in the second period but his 16-game scoring streak was snapped. … Anaheim D Cam Fowler was born in Windsor, Ontario — across the Detroit River from Detroit — and grew up in the Detroit suburb of Farmington Hills. … Ducks C Andrew Cogliano played at the University of Michigan.